Many textbooks on Systematic Theology are philosophical in their approach, ponderous in their thought, verbose in their exegesis, unclear in their presentation, and poorly organized in their subject matter; therefore, they are of minimal value to the average Christian. There has been, and is, a great need for a work on theology that meets the needs of the local-church pastor, the Bible-college professor, the Sunday School teacher, and the less-advanced Christian. In this book and in its companion book (volume two of a two-volume set), Brother Roy Gingrich, Pastor of Faith Bible Church, Memphis, TN, and Professor of Bible at Mid-South Bible College, Memphis, TN, has fully met the above-mentioned need. 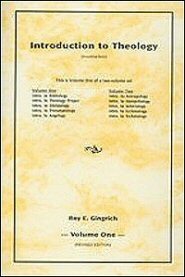 He has in this work, his most comprehensive work on the Bible and on subjects related to the Bible, given us an “Introduction to Theology” that is concise, clear, simple, well-organized, and above all else, Bible-based and Bible-centered. The organization of this two-volume set is unique and progressive. The author begins with Bibliology (the doctrine of the Bible) and then in logical order presents the other nine divisions of theology. Each of the ten divisions of theology is given thorough-but-concise treatment, profound-but-simple treatment, detailed-but-balanced treatment, and rational-but-Biblical treatment.